Today is the 20th anniversary of the fall of the wall and the beginning of my journey into Eastern Europe. I remember sitting in our TV room at John Brown University in shock as I watched this historical even which I NEVER thought would happen. Little did I know that this event would later chart my life in Poland. Polish Union leader Lech Walesa, lead union strikers in Gdansk, Poland to rebel against the might of Russia. Their passion and their courage to stand up against the USSR and sparked the start of the freeing of Eastern Europe. 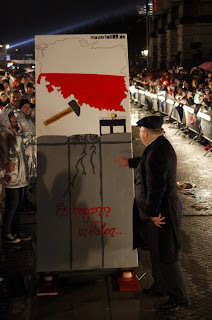 Tonight he got to start the domino wall that was set up along the line of the Berlin wall. It was amazing to see his face as he pushed that wall down. There is still captivity in the hearts of the Polish people, though. Today the European Union shows that there is 6 million young Poles (15-29 years old) who do not know Jesus. They might be religious, but as I have found, most are religious in identity only. Each camp I have been to, I am finding more and more religious agnostics. Their country is free, but their hearts are not! My prayer and my dream is in the next twenty years, the walls in the hearts of the Polish people will fall just as they did in 1989. I got to see the 20th streamed live on FoxNEWS. It was awesome!!! Do you remember, my unit was put on alert at Ft. Hood and then 3 months later I got to go to Germany with 2nd Arm Div. and see the East/West boarder. I pray too that the walls of the heart's of the people in "Polska" will be knocked down by the Truth. I love you Sis and can't wait for you to be back in the States. I love you and miss you. Donna and David send their love too!